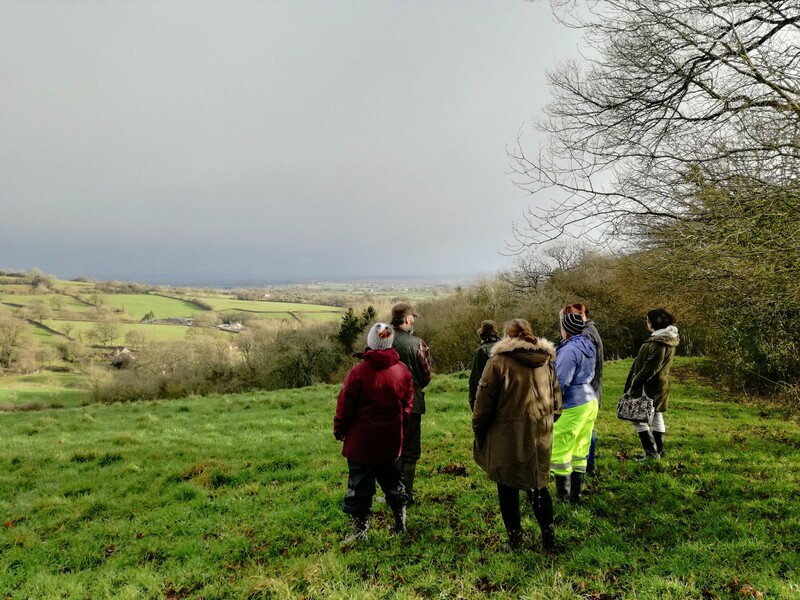 I’ve been enjoying volunteering with the Nature and Wellbeing project in the Blackdown Hills AONB since Summer 2017. This article is about my time spent with a group from the Watch project based in Chard, and describes their valuable visits to Folly Farmyard near Buckland St Mary. The sessions are appreciated by all people involved, for a variety of wonderful reasons. The Watch project is a friendly group, with most members experiencing social isolation or facing barriers in their community, due to various conditions and issues. 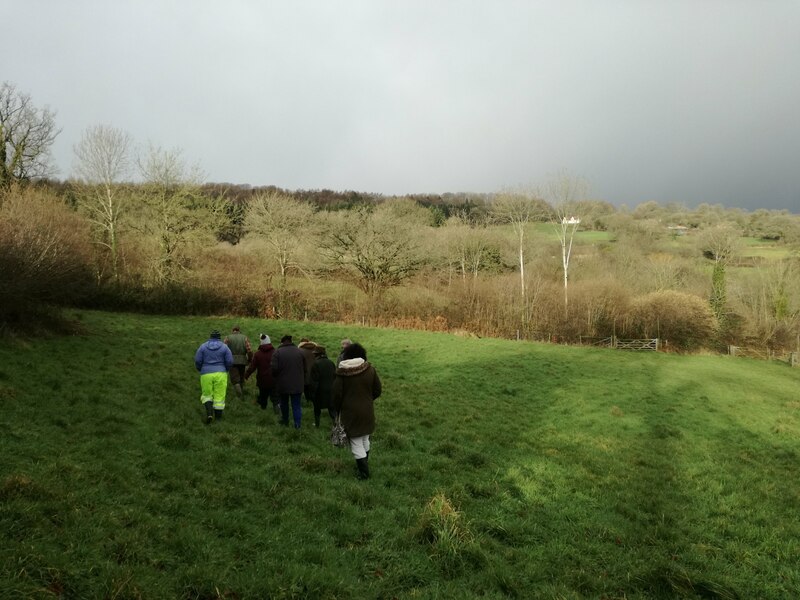 Usually around ten people come along to each session and leave smiling, commenting on how their time spent in the countryside impacts positively on their wellbeing. There is an ever-increasing body of evidence to support the use of the natural environment as a therapy for both physical and mental wellbeing. I also feel this positive effect. After working in the NHS as a physiotherapist for the last ten years, I’m changing my career path to work in the promotion and delivery of health and wellbeing activities in the nature conservation sector. Volunteering with the Nature and Wellbeing project helps me to gain experience in this upcoming area. Another person who benefits from these sessions is Jonathan, the farmer who lives and works at Folly Farmyard, who truly values the natural world and the principles of conservation farming. Jonathan is part of an agri-environment scheme, so he can access some financial support for managing his land in a way that supports biodiversity and improves the quality of our air, soil and water – tremendously important things! Providing educational and therapeutic community sessions on his land also enables Jonathan to get a little more funding for his work. Farming for the good of the land, wildlife and community is more costly than standard farming practices, and so it’s great that Jonathan is further supported through being part of the Nature and Wellbeing project. Jonathan is now looking to develop his facilities to enable him to welcome more groups (such as school groups) to his beautiful land. The views from Folly Farmyard are stunning and far reaching: on a clear day you can see as far north as the Polden Hills and the Mendip Hills, as far east as Cranborne Chase in Wiltshire, and to the south east as far as Pilsden Pen and the Wessex Ridgeway in Dorset. So, what do we do on these days at Folly Farmyard? All sorts of fun things, depending on the season and, to some degree, the weather. So far, I’ve attended a session in summer, autumn and winter (although the group has been attending for longer) and I’m excited about all that spring will have to offer us! Year-round it’s essential that we dig out the ditches on Jonathan’s land to keep the hay meadows drained to prevent too many rushes growing (which would prevent wild flowers from thriving). Jonathan has created scrapes (shallow ponds) and leaky dams in strategic places on his land to hold back water in times of heavy rain, allowing the water to filter through the land slowly rather than rush down onto the Somerset levels, causing flooding. This is part of important, countywide work to slow the flow of water from the Somerset Hills to the Levels. Clearing the ditches is good physical work, mentally therapeutic and purposeful. During the first session spent on this task, some of the group relaxed in a woodland clearing near to the ditches, whilst others went uphill to begin excavating the leaves, twigs and thick mud out of the bottom of the ditch, to leave a stony base layer. We had great fun getting muddy! 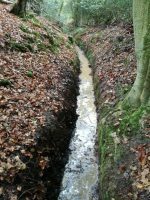 After just half an hour of ditch clearance work, the people relaxing in the clearing were delighted to hear the gentle sound of running water meandering downhill. This was a memorable moment and the ‘ditchers’ felt a sense of achievement in making such an impact on the landscape as well as the rest of the group. Brilliant! In the summer we enjoyed identifying the butterflies that are attracted to the wildflowers on the unimproved and species-rich grassland of Folly Farmyard. Within the last year, Jonathan has created a large pond and, in January, we tasted some delicious and peppery watercress growing there. We’re looking forward to seeing beautiful dragonflies as they emerge, giving us an opportunity to enjoy some mindful photography again. Perhaps we’ll do a pond-dipping activity next session! There’s so much life that lives unseen, both under the water and on its surface. Throughout the seasons there are edible gifts from nature to collect and enjoy together – blackberries, hazelnuts, and elderflowers for making scrumptious elderflower cordial and fritters. The interesting and diverse fungi we simply observe! Jonathan has a real talent for storytelling, telling us about the history of the land and workers of the Blackdown Hills. During our walks we also enjoy him explaining the nature conservation efforts made at the farm, for example, the provision of habitats for our native dormice, an endangered and protected species. The group from the Watch project is always interested to learn new things and everyone asks a lot of good questions. The group is incredibly talented and creative and has produced some stunning wildlife-inspired creations from clay and natural artefacts, as well as making Jonathan lovely and thoughtful gifts. We have popped corn, petted Starlight the pony, and practised our fire-lighting skills during practical conservation tasks. As you can see, the visits are varied and the attendees can choose what to participate in. I really recommend volunteering on this project, or with another of the volunteering sessions in the Somerset AONBs. New faces are welcomed by staff and there’s excellent and well-organised volunteer support. I believe that volunteering outdoors is a great way to have fun, enhance your wellbeing, sense of purpose and employability, and to meet other people. You also get to learn more about the natural environment and contribute to the important work of the AONB teams.